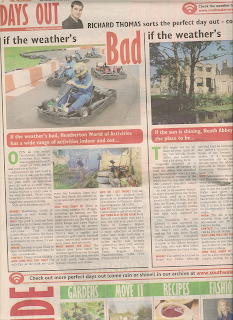 Below is my “Days Out” column from The Weekend supplement in the Saturday, October 21, 2013, issue of the South Wales Evening Post. Formerly the city's Guildhall, which was originally built in 1825, the Dylan Thomas Centre building was restored and refurbished to host the UK Year of Literature and Writing in 1995. Opened by former US President Jimmy Carter, one of the world's most famous Dylan Thomas enthusiasts, The Dylan Thomas Centre has a permanent exhibition on Dylan Thomas and his life and is also home to many literary events throughout the year. WHERE? The Dylan Thomas Centre is located in the in the Maritime Quarter near to Swansea Museum. WHY? Between October 27 and 9 October the centre will be holding its annual Dylan Thomas Festeval. Highlights include the launch of a new Dylan Thomas centenary commission from Gillian Clarke; Doctor Who Day, a celebration of Doctor Who's 50th anniversary with talks, events, special guests including Louise Jameson, workshops and Daleks. We'll present an evening on The Killing, featuring two of the biggest names writing about it: crime and mystery novelist David Hewson and Emma Kennedy, author of The Killing Handbook. Fluellen offer a preview of their production of Rebecca's Daughters, John Goodby discusses his new critical study of Dylan's poetry, and there will be readings from Dylan's work in his old local, The Uplands Tavern. WHEN? The Dylan Thomas Centre is open 10am to 4.30pm seven days a week. CONTACT: To book tickets for an event phone 01792 463980. HOW LONG WILL THIS TAKE? Event times vary. For information about the different event times visit: www.dylanthomas.com. WHO WILL ENJOY IT? As well as hosting artistic events, the centre also houses the permanent "Man and Myth" Dylan Thomas exhibition, the largest collection of memorabilia of its kind in the world. This exhibit is designed to appeal to the Dylan Thomas expert and interested visitor alike. WHAT ABOUT THE KIDS? To celebrate Doctor Who's 50th anniversary, on 2 November it is Doctor Who Day at the centre, experts and aficionados of the series will be on hand to discuss its history and future, with a children's art workshop, a writers' panel, and a visit from the Daleks. HOW DO I GET THERE? For sat nav users the centre's address and postcode is: Somerset Place, Swansea, SA1 1RR. LUNCH? Afterwards you can relax at the Meridian Tower, the tallest building in Wales, where on the top floor diners can enjoy first class Mediterranean cuisine and spectacular views of Swansea in the Grape and Olive. LUNCH: The assisted-service Vale Restaurant, situated on the first floor of the museum, serves hot and cold lunches; a range of sandwiches, baguettes & salads; home-made soup; cakes; and hot and cold drinks. The restaurant is family friendly and a range of children’s sandwich boxes and meals are also available. There is also the Gwalia Tea Rooms, a traditional 1930's tea room serving light lunches and afternoon teas, as well as the Cafe Bardi, situated in the Main Entrance Hall, which as well as hot and cold drinks, serves a variety of home-made cakes, sandwiches, boxed salads and soup. 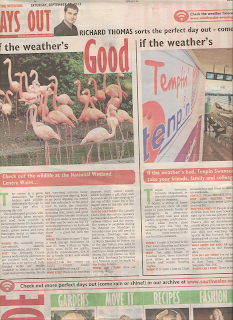 Below is my “Days Out” column from The Weekend supplement in the Saturday, October 12, 2013, issue of the South Wales Evening Post. The history of Margam can be traced back to the Bronze and Iron Age. Adjacent to the Go Ape Tree Tops Adventure site is Margam Abbey built in 1147 and the magnificent Margam Castle, a Gothic-Tudor mansion house commissioned by Christopher Rice Mansel Talbot in 1830. If you borrow an mp3 player free of charge from the kiosk you can eavesdrop on voices from the past at eight different spots inside the park. Written by David Hughes and recorded by local actors, these echoes from the past offer a fascinating insight into the lives of people who have worked, visited or lived on the estate over the centuries. Today Margam Castle has become a popular filming location for TV shows. Last summer the production team for the new drama series the Da Vinci's Demons written by David S. Goyer, who also penned the scripts for Batman Begins and Blade, were busy setting up camp at the castle. The park is also home to Go Ape, where thrill seekers can enjoy up to three hours in the tree tops tackling zip wires, Tarzan swings, rope ladders and hire-wire crossings, and after completing the course join the Go Ape tribe. WHERE? Margam Park is located in Port Talbot, along the eastern rim of Swansea Bay. WHY? The 850 acre estate boasts a magnificent 18th century orangery, an impressive and picturesque Tudor-Gothic style Victorian mansion house, a 12th century chapter house, ornamental gardens and one of the best deer herds in Wales. Throughout the year, Margam Park also hosts various events from Living History Weekends to Clown Festivals and Charity Walks. WHEN? Margam Park is open daily between 10am and 4.30pm until 31 March. CONTACT: Vist www.margamcountrypark.co.uk or phone 01639 881635. HOW LONG WILL THIS TAKE? Go Ape participants have up to three hours to complete the course, but there are lots of other attractions to check out before you head back home. WHO WILL ENJOY IT? People tackling the Go Ape course are mostly teens and 20- and 30-somethings, many of them students, but there are also some dad's and mum's with their children. There's plenty to keep the rest of the family busy at Margam too, if they don't want to swing from the tree tops. The Citrus House was built around 1800 to replace earlier greenhouses on the estate, but in 2007 the glasshouse fell into disrepair and deemed too dangerous for public access. With the help of a grant from The Rural Development Plan the Citrus House has now been painstakingly restored to its former glory. WHAT ABOUT THE KIDS? On the Go Ape course under 18s must be supervised by a participating adult. Participants must also be at least 10 years old and 1.4 metres tall and no more than 20.5 stone. An adult can supervise either two children, where one or both of them are under 16, or up to five 16 to 17 year olds. Children will enjoy the other attractions inside Margam Park like the narrow gauge railway, adventure playground, farm trail and Fairytale Land. HOW DO I GET THERE? For sat-nav users the address and postcode is: Margam Country Park, Margam, Port Talbot, SA13 2TJ. WHERE CAN I PARK? Margam Park has an on site car park, but there is a charge of £4 for cars, £6.90 for mini buses and £13.70 for coaches. LUNCH? Margam Park's Discovery Centre Cafe serve a range of hot drinks and cakes, but a lot of visitors opt to bring picnic lunches to Margam when the weather is good. ANYTHING ELSE IN THE AREA? At the South Wales Miners’ Museum in Afan Forest Park visitors have the chance to take a step back in time and see what life was like for miners and their families through their eyes. The museum celebrates the coal mining industry and its workforce in the South Wales coalfield. The past is brought to life at the museum using a comprehensive collection of photographs, historical artefacts and even life sized models of miners dressed in original gear and equipment. There is a small charges to help with the costs of running the museum. Entrance fees are £3 for adults and £2 for seniors and children 5 and older. Situated close to the museum is a range of outdoor exhibits including a blacksmith shop and lamp room to check out. The museum is located in the beautiful Afan Valley and is only six miles on the A4107 from the M4. For sat-nav users the address and postcode is: South Wales Miners' Museum, Afan Forest Park, Cynonville, Port Talbot, SA13 3HG. Pre booking is advisable. Phone 01639 851833 or go to www.southwalesminersmuseum.co.uk. Take a trip in the TARDIS at the Doctor Who Experience. At the Doctor Who Experience time travellers help the Doctor pilot the TARDIS and come face-to-face with some of the show's most iconic villains. Featuring exclusive filmed sequences with the Eleventh Doctor, Mat Smith, and packed with amazing special effects, this multi-sensory experience is fun for everyone and not just Doctor Who fans. WHERE? 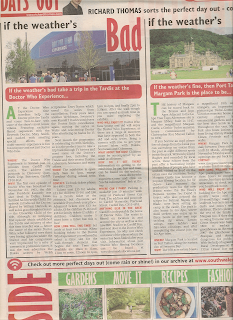 The Doctor Who Experience is located just 10-minutes from Cardiff city centre. The address and postcode is: Discovery Quay, Porth Teigr, Butetown, Cardiff, CF10 4GA. WHY? The first ever episode of Doctor Who was broadcast on November 23, 1963, the day after President Kennedy was shot dead in Dallas, Texas. Entitled "An Unearthly Child" the episode introduced the Doctor, played by William Hartnell, as well as his granddaughter Susan - the "Unearthly Child" of the title. Although, an intriguing first episode which established the TARDIS and mystery of who this time traveller was - hence the name of the series Doctor Who, what followed were three very boring episodes where the Doctor and his companions were imprisoned by a tribe of cavemen in prehistoric times. It was the next adventure "The Daleks" written by Welsh scriptwriter Terry Naton which saved the series from cancellation. Forty years later another Welshman, Swansea's own Russell T. Davies would save the Doctor from cancellation again, moving the series to Wales and reinventing Doctor Who after being on hiatus for 15 years. Next month the programme is celebrating its 50th birthday, so it is the perfect time to take a trip back through TV history and meet some of the Doctor's greatest foes, including the Daleks and their creator Davros, Cybermen, Sontarans and many others. WHEN? The exhibition is open daily 9am to 5pm, except Tuesdays during school term time. CONTACT: To book tickets phone 084 4801 2279. Tickets cost £15 for adults; £11 for children (5-16) and £46 for a family ticket at the entrance, but discounts are available if you book your place. Advanced tickets cost £13 for adults, £9 for children (5-16) and £38 for family tickets (2 adults, 2 children). Children under 5 must have a ticket but this is free! HOW LONG WILL THIS TAKE? Set aside at least 2-hours. When booking tickets to the Doctor Who Experience you will need to select a time slot for the walk-through element that begins the tour. Time slots available are: 10am to 11am, 11am to 12noon, 12noon to 1pm, 1pm to 2pm, and finally 2pm to 3.30pm. After the walk-trough you can spend as much time as you want exploring the exhibits. WHO WILL ENJOY IT? Doctor Who fans young and old will enjoy the Doctor Who Experience, as there are a range of monsters that have appeared in both the old and new series. Bring a camera with you to get your picture taken with Daleks, Sontarans and Cybermen. WHAT ABOUT THE KIDS? Children must be accompanied by an adult at all times. HOW DO I GET THERE? Information on getting to the exhibition by car, bus and train can be found on the website. Visit: www.doctorwhoexperience.com and click on “useful information” link at the top. WHERE CAN I PARK? Parking is available just 10-minuets walk away at Pierhead Street Car Park. The address and postcode is: Cardiff Waterside, Pierhead Street, Cardiff Bay, CF10 4PH. ANYTHING ELSE IN THE AREA? Cardiff is indisputably the home of Doctor Who. The series is filmed on location in and around the city as well as at the new BBC Studios in Cardiff Bay, just next door to the Doctor Who Experience. So why not check out some of the places where the series has been filmed after your visit. Information about past Doctor Who filming locations can be found atwww.doctorwholocations.net. 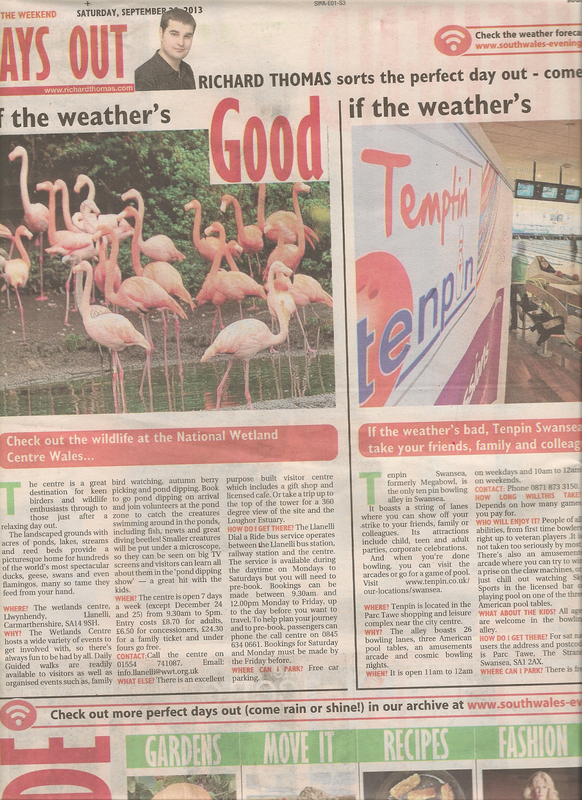 Below is my “Days Out” column from The Weekend supplement in the Saturday, October 5, 2013, issue of the South Wales Evening Post. From spectacular natural scenery to stunning monument settings, the historical and archaeological landscapes of South Wales have lots to offer. One great place to visit is Neath Abbey and Gatehouse. Originally founded as a daughter house of Savigny in 1130, the abbey was absorbed into the Cistercian order in 1147. Fairly complete remains of the abbey survive, together with the 16th century mansion raised within its precincts. As well as its ancient history, in more recent times the Abbey has been used as a filming location for Doctor Who. Scarier than the Daleks, though, are the many stories of ghostly monks that are said to haunt the ruins and have been reported by visitors. On 16 November 1326 Edward II was captured by forces loyal to Queen Isabella, the king's own wife, whilst making his way from Neath Abbey towards Caerphilly Castle. According to local legend a monk at the abbey betrayed the king, who was later killed, and still haunts the ruins today. WHAT ABOUT THE KIDS? Children less than 16 years old are welcome but must be accompanied by an adult at all times. HOW DO I GET THERE? Off the A465 follow the A4320 Skewen signs. Turn left opposite the Hope & Anchor public house. A map can be found at www.cadw.wales.gov.uk/daysout/neathabbeyandgatehouse. ANYTHING ELSE IN THE AREA? Located in Port Talbot, along the eastern rim of Swansea Bay, Margam Country Park boasts a magnificent 18th century orangery, picturesque Tudor-Gothic style Victorian mansion house, a 12th century chapter house, ornamental gardens and one of the best deer herds in Wales. Children will enjoy the narrow gauge railway, adventure playground, farm trail and Fairytale Land. For sat-nav users the address and postcode is: Margam Country Park, Margam, Port Talbot, SA13 2TJ. Visit: www.margamcountrypark.co.uk. Open all year round Heatherton World of Activities is a family leisure park with a wide range of both indoor and outdoor activities, offering something for the whole family to enjoy. Admission to the park is free as visitors only pay for what they want to do. Each activity at the park holds an individual price as well as a credit value. For the best value for money buy a credit pass. These range from 5 to 100 credits and the more credits you buy the more money you can save on the attractions. Visit www.heatherton.co.uk. WHERE? 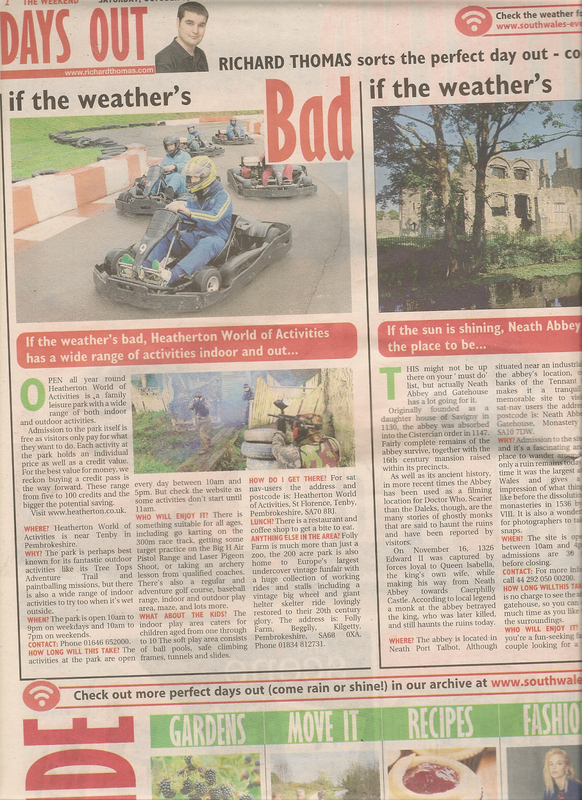 Heatherton World of Activities is located near Tenby in Pembrokeshire. WHY? The park is perhaps best known for its fantastic outdoor activities like its Tree Tops Adventure Trail and paintballing missions, but there is also a wide range of indoor activities to try too when it’s wet outside. WHEN? The park is open 10am to 9pm on weekdays and 10am to 7pm on weekends. HOW LONG WILL THIS TAKE? The activities at the park are open every day between 10am and 5pm. But check the website as some activities don’t start until 11am. WHO WILL ENJOY IT? There is something suitable for all ages, including go karting on the 300m race track, getting some target practice on the Big H Air Pistol Range and Laser Pigeon Shoot, or taking an archery lesson from qualified coaches. There’s also a regular and adventure golf course, baseball range, indoor and outdoor play area, maze, and lots more. WHAT ABOUT THE KIDS? The indoor play area caters for children aged 1 to 10 years old. The soft play area consists of ball pools, safe climbing frames, tunnels and slides. HOW TO GET THERE? For sat nav-users the address and postcode is: Heatherton World of Activities, St Florence, Tenby, Pembrokeshire, SA70 8RJ. LUNCH? There is a restaurant and coffee shop to get a bite to eat. WHERE CAN I PARK? There is a car park on site. ANYTHING ELSE IN THE AREA? Folly Farm is much more than just a zoo, the 200 acre park is also home to Europe's largest undercover vintage funfair with a huge collection of working rides and stalls including a vintage big wheel and giant helter skelter ride lovingly restored to their 20th century glory. The address is: Folly Farm, Begelly, Kilgetty, Pembrokeshire, SA68 0XA. Phone 01834 812731. 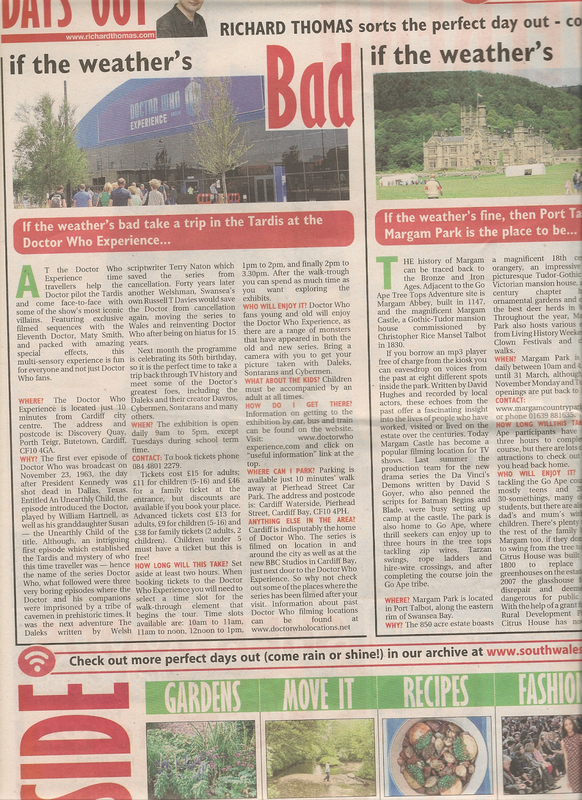 Below is my “Days Out” column from The Weekend supplement in the Saturday, September 28, 2013, issue of the South Wales Evening Post.